Friends of detained fishermen wait anxiously for news. Wei Tian reports from Jinjiang in Fujian. It has been 12 days since trawler captain Zhan Qixiong left home to fish on the East China Sea, where generations of Chinese fishermen have made a living. But Zhan would never have expected the events of last Tuesday - when he and his boat were seized in waters off China's Diaoyu Islands by Japan's coast guard - that triggered the dramatic changes in his life. His 85-year-old grandmother - who was recovering from an earlier fall - died last Wednesday hours after hearing of his arrest. "She was fine when I called her in the morning," relative Zheng Feng told China Daily. "But she got a lot worse after she heard the news." Zhan, 41, and 14 other crew members of the Minjinyu 5179, were taken into custody in the early hours last Wednesday, sparking strong protests by the Chinese government and campaigners calling for their release. According to Japanese authorities, the Chinese vessel collided with two coast guard patrol boats before it was intercepted on Sept 7. The captain was later arrested for "obstructing offi cers on duty". On Friday, Ishigaki Summary Court in Japan's Okinawa prefecture approved the detention of the captain until Sept 19. His shipmates have not been arrested but are confi ned to the trawler. The front door of Zhan's family home in Ganghu town was closed on Saturday, an unusual sight in this closeknit fishing community in the coastal city of Jinjiang, Fujian province. Zhan's wife, whose surname is Chen, refused to comment when approached by China Daily. However, a neighbor who insisted on being identified only as Wu said the arrest is among several blows suff ered by the family in recent years. "Things were not good even before this incident," she said, explaining that the trawler captain's father died two years ago, while his mother has cataracts and heart disease. To bring in extra cash, Zhan's wife has been working in a printing factory, said Wu. In accordance with the village's customs, Zhan, as the eldest grandson, should perform traditional rituals within seven days after the death. His grandmother's body has been packed in ice and cannot be buried until he returns, said Wu. "The couple's 13-year-old son keeps telling his mother not to worry, that his daddy will be back soon," added Wu. "He's a strong boy." Xu Lilong, who has been fishing the coastline of Fujian for three years, was working on the Minjinyu 5178 near the Diaoyu Islands when coast guard patrols arrived on Tuesday. 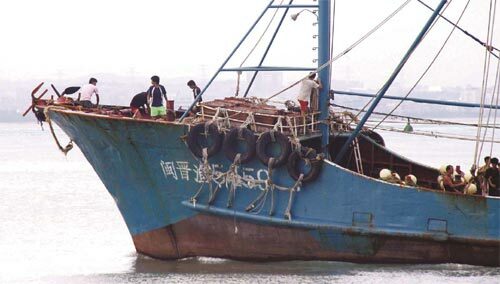 Officers on the Japanese boats claimed the Chinese trawlers were operating illegally and ordered them to leave, he said. "Ours was among hundreds of vessels operating in those waters at the time," said the 33-year-old. "Suddenly, three Japanese boats appeared shining powerful spotlights and one began to chase us. I was petrified. "Their boats are much larger and faster than ours but our captain is experienced," said Xu. "He immediately turned the vessel around and headed home at full speed. The Japanese couldn't catch us thanks to our large wake." However, the 37-meter Minjinyu 5179 was unable to navigate away and was quickly trapped by the coast guard's 1,300-ton Yonakuni. Media reports in Japan citing the nation's coast guard said Zhan's trawler collided with the Yonakuni at 9:15 am on Tuesday morning and then with the Mizuki, another patrol boat, 40 minutes later. No injuries were reported. 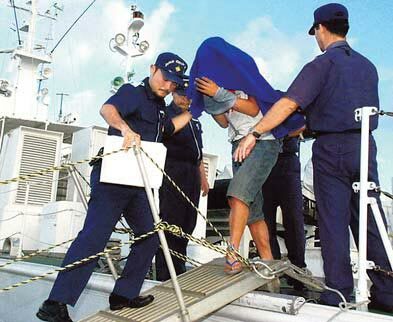 Coast guards arrived the next day to seize the captain, his crew and his boat and take them to Ishigaki Island, according to NHK, Japanese broadcaster.